Alfalfa Supplement Uses - Pregnancy, Arthritis and Cholesterol! Alfalfa has been shown to be a great provider of essential nutrients including vitamins E, A, K, B1, B6 and C. It also contains calcium, potassium, and other beneficial minerals. For these reasons, amongst others, some people consider alfalfa supplement options. This is because there are many other benefits that people may gain from this flowering plant besides just alfalfa sprouts nutrition. As far back as the sixth century, alfalfa has been used in ancient Chinese medicine. It’s been used to cure a whole host of ails, mostly by way of alfalfa leaves, usually dried. While many parts of the plant are used, alfalfa seed side effects can be harmful or undesirable, and, as such, most alfalfa supplement options are comprised of the leaf parts. This is not true however in the case of cholesterol. Studies have shown that the seeds may potentially be useful in lowering cholesterol. “Bad” cholesterol, that which is commonly referred to as “LDL,” also purportedly can be reduced. The same seeds that yield potentially beneficial effects on cholesterol however, can have autoimmune type reactions that can mimic the symptoms of Lupus, or exacerbate symptoms in people with an existing condition. Because of the reactions associated, pregnant and breastfeeding women should not take alfalfa seeds or an alfalfa supplement that is made from the seeds. Birth defects and danger to the baby have been associated risks to using alfalfa seed during pregnancy. Bear in mind that eating alfalfa leaves, however, is not associated with these same risks and is normally considered safe and an excellent source of nutrients needed during pregnancy. 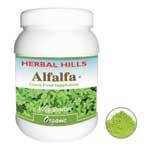 Because of the nutrient-rich contents of alfalfa, it is thought to be effective in the fight against arthritis. More evidence is needed to confirm this, however since many of the nutrients that comprise alfalfa benefits are thought to be helpful in the forming and strengthening of bones, a trait that potentially can prove useful to arthritis sufferers. Many users offer that tea is the best vehicle for delivery of these power packed nutrients, and if you didn’t already have a good enough reason to buy alfalfa tea, perhaps some of its other purported used will stimulate you further. Hair loss, bladder ails and kidney troubles are all thought to be remediable by an alfalfa supplement.